Spring is here and I’m in the mood for radish recipes. You too? Well you’ve come to the right place. 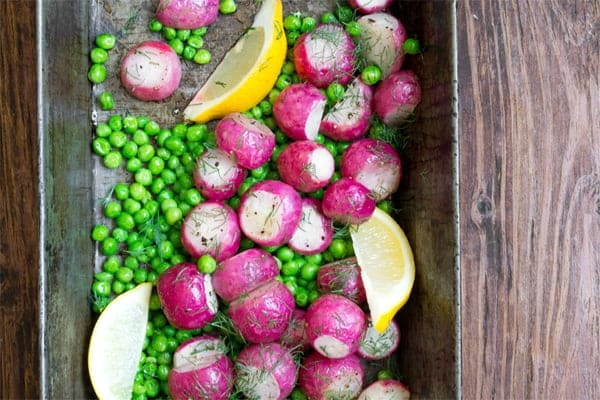 Today, I’ll show you how to make roasted radishes (and why you should cook radish!) so that you can add radishes to recipes in a whole new way. There are many people who would rather try eating a bowling ball than crunch through a radish with its strong wasabi-like flavor. I’m not one of those people, but I get it. Radishes can be softer and milder, even converting those bowling-ball-eaters out there. How so? When you cook a radish, even for just a short time, it becomes a bit softer and a bit milder. Imagine a par-cooked potato with a hint of fresh coleslaw and green onion. Good, right? If you cook radishes for longer (and you can, though I usually don’t) they get even softer and milder still. This losing of the radishes distinctive bright color is a sad thing, perhaps. Except that it means you can sometimes fool those bowling-ball people into actually giving radishes a chance. And I bet you they’ll say thank you before they start searching for some cooked radish recipes of their own! If you’re aiming for the just-slightly-cooked radishes (these are the best), roast them like this: Set your oven really high (450ºF). Trim the ends off of the radishes and cut any big ones in half. Toss the radishes with some melted butter or oil and a good pinch of salt and pepper. Roast them for about 10-15 minutes. You want a fork to still have a bit of trouble getting through (you’re not aiming for the full-cookedness of a potato here. More like a fork pushing into an apple, a bit of pressure required, but not too much). When they’re done, take them out of the oven, toss them around the pan again and transfer them to a serving plate. Add a good sprinkling of salt. If you’re aiming for the fully mild totally soft radishes, roast them like this: Trim the ends off of the radishes and cut any big ones in half. Preheat your oven really high (450ºF). Toss the radishes with some melted butter or oil and a good pinch of salt and pepper. Roast them for about 20-25 minutes, bamming them around in the pan about halfway through. You want a fork to go through as easily as it would into a cooked carrot. Why add salt at the end? The radishes are still a bit bitter. If you want those bowling-ballers to be convinced, you need something to take that edge off. I do a liberal sprinkling of coarse sea salt. But any kind will do. Feel free to fancy things up with some chopped parsley or dill at the end too. And then serve. I’ve also seen a lot of radish recipes that involve panfrying. I havne’t tried this technique myself but my mom made a batch of these for me last year. They were incredible! You can pan-fry radishes whole, halved or sliced. Just warm some oil over medium heat, add the radishes and some seasoning and cook, stirring occasionally until they’re as soft as you’d like. Make a radish stir-fry! Slice the radishes and stir-fry them alongside your other usual ingredients. They add that slight cabbagey note and a tiny bit of heat, like an onion would. Cooked radishes are also lovely in fish tacos (or any other kind of taco!). Slice them and then pan-fry as above. The short roasting time for the radishes leaves them with a little crunch but mellows out their flavor so they’re not quite as spicy. 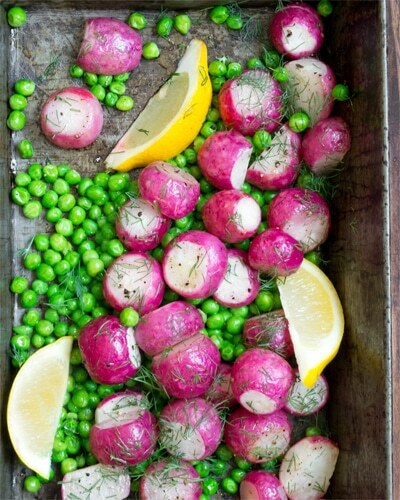 In a medium baking pan, rattle the radishes around with the olive oil, ¼ teaspoon of salt and a dash of black pepper. Put the pan into the preheated oven for 10 minutes. Meanwhile, place the frozen peas into a medium bowl and then flood them with hot tap water. Let them stay under until defrosted, 3-5 minutes. Drain and pat dry with a kitchen towel. Remove the pan from the oven. Add the defrosted peas to the radishes. Rattle the pan again and then put it back into the oven for 2 minutes (just to heat the peas through. 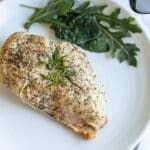 Remove the pan from the oven, sprinkle everything with the dill and another ¼ teaspoon of coarse salt. Snuggle in the lemon wedges and serve. 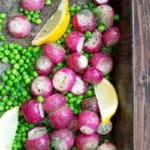 Beautiful picture and delicious Radish Recipes. 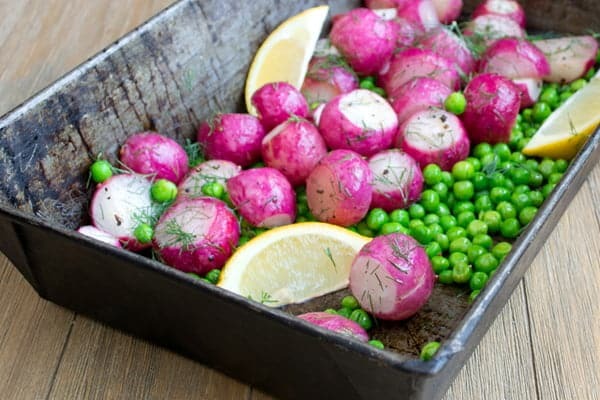 I just tried your oven roasted radishes with peas and dill. Fabulous! Thanks for the great tips about salting at the end. I used sea salt and ground peppercorn. My Family really loved this vegetable dish. Oh wow! I’m so happy you liked the recipe. Yes, the salt at the end is a must for sure. Sea salt is a great choice. This is seriously stunning. I need to try this. I love cooked radishes. The first time I tried them was a recipe from Laura Calder. At first I thought, who would want to eat cooked radishes. I tried them anyway for Barry and I, then for a dinner party. 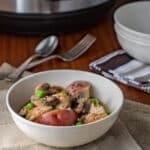 Our guests could not believe how delicious they were, plus the colors with peas and bacon looked incredible on the table. Your picture is beautiful. Wow! I’ve never thought to cook radishes!!! 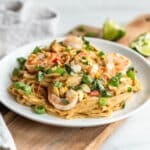 I must give this recipe a try. Photos look beautiful!